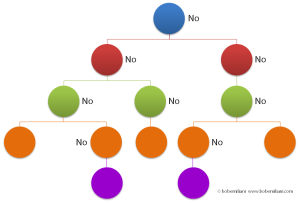 “No” is a bad word for leaders to say. It broadcasts to people, “Don’t try new things,” “Don’t experiment with different ways to correct the problem,” and “Don’t take action when problems arise.” It shut’s down people’s minds and disables the uniquely human challenge to make things better through thinking and creativity. Unfortunately, organizations are hierarchies in which there are too many people who can say “No.” Leaders who say “No” teach followers to maintain the status quo. Why do people in leadership positions say “No?” Are they insecure? Do they think those below them are inferior? Do they misunderstand what is being said to them? Are they trying to preserve a social or political structure? Whatever the reason, saying “No” disempowers people, drains them of their energy and enthusiasm, and makes them compliant to their bosses’ wishes. By disrespecting people, the boss maintains control. The boss is happy, but nobody else is. Unlike most CEOs, Art realized that he was the pacemaker for improvements made by everyone in the company. If he and his leadership team said “No” a lot, then improvement would occur slowly and its impact would be small. If, instead, he and his leadership team said “Yes” a lot, then improvement would occur quickly and its impact would be big. “Yes” respects people, and enables them to recognize problems and unleashes their minds to think and be creative to make improvements.